Andrew was born in Germany to an English soldier and a German mother. He grew up travelling to many places with his family. Andrew and his sisters moved with their mother to the US in the early 1970's and in his mid teens he returned to Germany and then England to complete his education (something that he did not succeed in doing - he lived near the river Wye in Hampshire, England and spent most of the days fishing for brown trout rather than attending his studies). Andrew did go on to earn a BS in marine biology and a BA in terrestrial ecology and is now working on a masters in curriculum design to complete the requirements for renewing his teaching license. Andrew caught his first trout, a nice cutthroat, at a tender young age, with a hook, line and worm attached to a stick. His first salmon was caught by hand and was larger than him, weighing almost half his weight. A chain link fence that had been stretched across the creek and used as a bridge had a lot to do with the success of that venture. Andrew began tying flies when he overheard a conversation about how fly fishermen did not have to deal with changing baits, dirty hands and getting dirt on their sandwiches when they fished. His first fly was tied in-hand and made with a bait hook, some grey mallard, and sewing thread that he pinched from his mother's sewing kit. The fly was stolen, as was the next one, and that told him that he was on to something, so he continued to tie flies. However, Andrew did not fish them since he had no fly rod but he did attempt to cast them, unsuccessfully, with a bait rod. Years later, in his late teens, he bought a vise and began tying using this tool rather than his hands to grasp the fly, continuing to tie Atlantic Salmon flies in-hand for a good deal longer. Andrew returned to in-hand tying trout flies around 2009 and now can tie most flies either in-hand or in a vise. 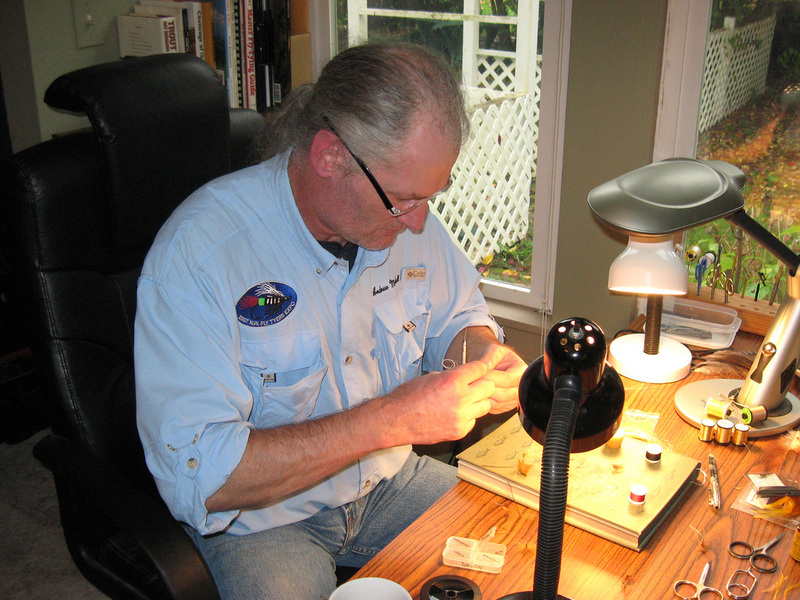 Andrew has been tying flies for over 35 years, tying pretty much any type of fly that he has the materials for and the fancy to try. He doesn't like to be limited to any one type of pattern. Andrew's first book, The History and Evolution of the Trout Fly - Part 1 is the first of a three part series. Part 1 cover flies from Biblical times to the year 1800 and presents the patterns in both historical context and practical hands-on patterns for modern tiers. Andrew tied all 299 patterns in-hand. Part 2 will cover the nineteenth century and Part 3 the twentieth. Andrew writes about classic fly tying and patterns on his various blogs, including Atlantic Salmon Fly Guy's Blog, Seventeenth Century Flies Blog, Exploring Classic Streamer Patterns Blog, Speyes, Dees and Tays, and Atlantic Salmon Fly Guy. Andrew also does demonstrations at the Northwest Fly Tyer and Fly Fishing Expo each March in Albany, Oregon and teaches in-hand fly tying.